Call Me Claus is a made-for-TV movie about an aging Santa Claus recruiting a home-shopping network executive to take his place. The concept, as these things go, could have been worse. The execution really couldn't have been. The executive is played by Whoopie Goldberg, and Nigel Hawthorne plays the old Santa. This was Hawthorne's last role: he passed away a few weeks after this premiered. It's really hard not to make a joke right now. The movie opens in 1965. A young girl asks a mall Santa to bring her father, who's serving in the military, home for Christmas. He waffles, but lets the kid try on his hat. The hat glows, but no one notices. When the girl returns home, a pair of army officers are waiting to give her mother some bad news. This entire sequence was shot with all the emotional resonance of an online tax tutorial. Maybe less, now that I think about it. The story jumps ahead to the present day. Well, it jumps to 2001, which used to be the present day. The girl's grown up and works at the aforementioned home-shopping network. She clearly makes a decent salary, but still drives her father's old car out of sentiment. It should be noted that her one defining character trait is that she's not sentimental or emotional in the slightest. She's producing a Christmas show on the network and needs to hire a decent Santa. For some reason, everyone who shows up to audition is comically inappropriate. Everyone, that is, except for the real Santa Claus, who's there trying to find her. Turns out, this is a Santa Clause-style deal, except that the mantle passes every two-hundred years. If a suitable replacement can't be found, then there will be no more Christmas. Also, the polar ice caps will melt, and everything on Earth will drown. It should be noted that this has happened before. Noah's flood, we're told, was due to them being unable to locate a replacement Santa Claus. Also, the first Santa Claus was Saint Nicholas, the fourth century bishop. Just so we're clear on the amount of thought that went into this. Of course, he gets the part, then is promptly fired after going off-script. Then re-hired when they realize he sold a ton of holiday crap anyway. Then, because this thing wasn't nearly unpleasant enough yet, he corners Whoopie Goldberg's character in her house and tells her to close her eyes. She's frightened and says she has mace. He teleports her to the North Pole, shows her around, and explains the situation. She either has to become Santa, or the world will be destroyed. Since there's still a half-hour to fill, she freaks out and says she wants to go home. Santa returns her and convinces her it was all a dream. 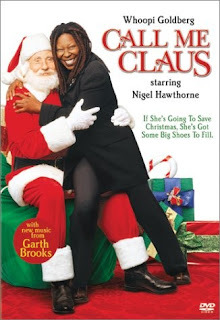 The rest of the movie is basically killing time until Goldberg's character decides she believes, puts on the magic hat, and suddenly turns into Santa. For the briefest of moments, we thought we were done. Nope. There's an awkward "learning to be Santa" sequence, followed by her going to see her niece sing in a church. There's more than a little Jesus in this movie, which is weird, because the seasonal connection with the weather is pretty damn pagan. There are two elements of this thing that are promising. Not good, mind you - just promising. The first is Hawthorne's Saint Nick. He plays the role fairly seriously and almost manages to sell it. If the writers and director had given him anything to work with - anything at all - I think he'd have nailed it. Unfortunately, this script was garbage, and the director didn't even do that justice. The other intriguing facet was the head elf. The first few times he showed up, there was a vague horror-movie vibe to his magically-enhanced entrances. For the briefest of moments, the movie was almost interesting. The bad, of course, was everything else. And I do mean everything. The tone was inconsistent, oscillating from bad dramedy to even worse slapstick. The digital effects were horrible, even for TV circa 2001. This was almost impossible to sit through, even for us. If you're wondering whether the movie's message in some way helped redeem it, think again. A handful of baffling racist jokes undercut the theme. There was a random comment about Hindus that felt offensive, a strange joke about goblin ancestry that seemed to insult multiracial children, and a few other comments and side jokes that were questionable at best. The worst of these were only borderline offensive, but they were still bizarrely out of place here. Obviously, there is no reason you should ever watch this movie.